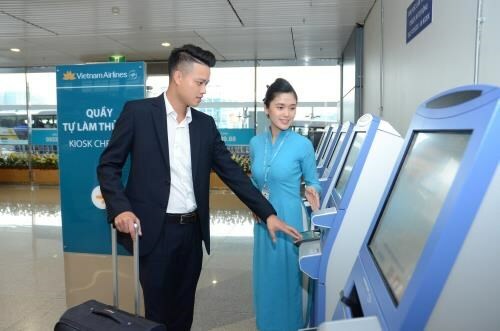 Hanoi (VNA) – The national flag carrier Vietnam Airlines has announced that it will introduce automatic check-in kiosks at London’s Heathrow Airport in the UK from April 8. The airline has already launched this service at Narita International Airport, Kansai International Airport, and Fukuoka International Airport in Japan; Incheon International Airport in the Republic of Korea; Frankfurt International Airport in Germany; and the three domestic airports of Noi Bai, Da Nang, and Tan Son Nhat. It will also be expanding the service to Haneda Airport and Nagoya International Airport in Japan, Busan International Airport in the Republic of Korea, Guangzhou Baiyun International Airport and Hong Kong International Airport in China, and Changi International Airport in Singapore. The kiosk allows passengers to check in from 24 hours to 60 minutes prior to the scheduled departure time without waiting in queues. According to the airline’s representative, the installation of the self check-in kiosks is part of its digitalisation process to bring the most convenient services to the customers. The airline has been making strides towards becoming a digital airline in the future. As of the end of 2018, about 40 percent of the carrier’s passengers departing from Noi Bai, Da Nang, and Tan Son Nhat airports used online check-ins via website, mobile application, and airport kiosks. Vietnam Airlines is operating 94 routes to 21 domestic and 29 international destinations with an average of 400 flights per day, connecting the world’s major cities to travel destinations in Vietnam, Laos, Cambodia, and Myanmar. Vietnam Airlines became a member of SkyTeam – a global airline alliance whose 20 members provide access to an extensive global network of 16,609 daily flights to 1074 destinations in 177 countries – in 2010, reaffirming the carrier’s position on the global aviation map. In 2015, Vietnam Airlines became the first airline in the world to successfully operate both next-generation aircraft Boeing 787-9 Dreamliner and Airbus A350-900 XWB at the same time.